' Trix Rice Krispies [Pinterest Challenge] - Sisters, What! It's Pinterest Challenge Saturday. 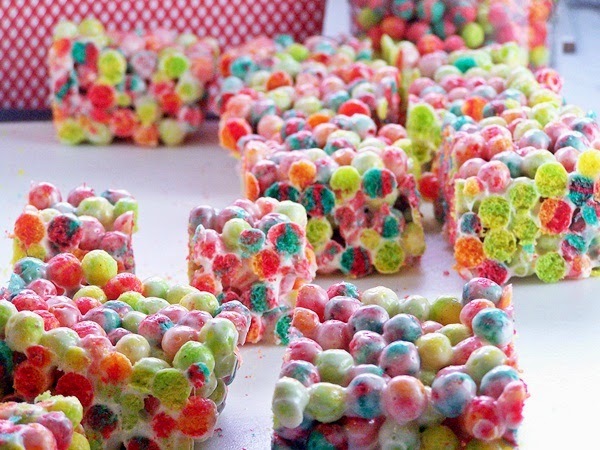 This week we made a twist on the ever favorite rice krispie treats - Trix Krispies. I seriously had no idea how many amazing twist there are on the rice krispie treat. The blog Mallow and Co has a plethora of variations, seriously check her blog out. We however did the variation with Trix following this recipe here from the blog Craving of a Lunatic. Delicious and gone in seconds. Definitely a favorite.